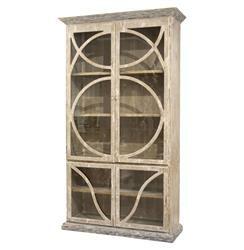 This rustic showcase cabinet looks as perfect in a French farmhouse as it would in an industrial modern loft. Its hand-rubbed taupe finish highlights the vintage beauty of the reclaimed wood while the curved design on the doors adds an unexpected elegance. This vitrine provides ample space, and a spectacular backdrop, for your colorful treasures to be proudly displayed.